In 2007 The Logos of taxis were changed. to leave the Metered Taxi Rates visible to the public. to the rear door where they were still in plain sight and visible to all. that only said "Metered Fare"
There was no need to do this! before they take a taxi. - operating illegally by picking up street hails!! Bloomberg is gone... and Yassky is out at TLC. 8)the cab doors. They should have never been removed !! The last proposed item of legislation – Intro 929-A – would require the rate of fare and the word “taxi” to be placed on the exterior of every vehicle authorized to accept a street hail. Respectfully, we disagree with the requirements of this bill. While the Commission shares the motivation behind this legislation – the education and protection of consumers – this bill fails to achieve that goal. Instead, other current and planned innovations will better accomplish this goal than the alteration of door decals. 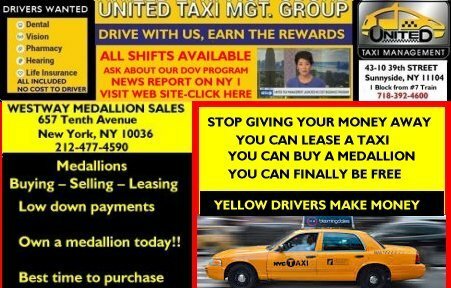 As you certainly know, all New York City taxis are already a uniform yellow color and have identical markings. They also all have distinctive roof lights which display the taxi medallion number specific to that vehicle, and a medallion affixed to the hood. All of these features readily mark them as New York City taxis. This combination of uniform color, uniform markings and distinctive roof light turn an otherwise nondescript Ford Crown Vic or Toyota Prius into that iconic symbol of New York City – the New York City taxicab. And no one seeing one of these unique yellow vehicles from a block away can have any doubt that it is a New York City taxicab. The New York City taxi is one of the world’s most identifiable brands and its iconic nature is a key element to the industry’s success. But more than this, the yellow taxi is a ubiquitous presence in the City; particularly in the Manhattan Central Business district, where taxicabs are often a large percentage of the vehicles on the road. And in that environment of persistent messaging and visual clutter, simplifying and cleaning up the markings on 13,237 taxis can make a real difference. In 2007, the TLC introduced new exterior markings for the first time since 1970, which included a modernized fare panel and a bold “T” in a circle followed by “AXI”. Building upon those changes, we again engaged design professionals to help improve the taxis’ iconic appearance. Based on their counsel, we recently replaced the words NYC TAXI on the side doors with a smaller NYC and the letter T; and we simplified and reduced the fare information that was posted on the door of the taxi. 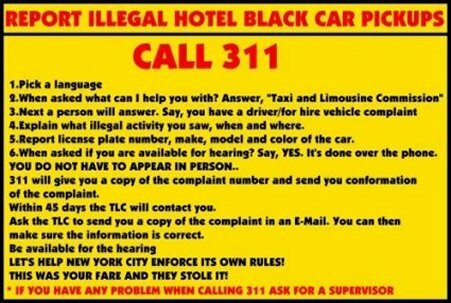 We have not had increased complaints from passengers – neither residents nor visitors – that this change has made it harder for them to discern a New York City taxi from the sea of vehicles on our City’s streets. And we have not had any discernible increase in complaints from passengers that they didn’t know the taxi fare before entering the cab. Now in contrast, cities such as Los Angeles, San Francisco and Washington, D.C., require the word “taxi” to be on the door of the vehicle. Having the word “taxi” is a useful tool in these cities where taxicabs are a variety of color combinations depending on the particular taxicab company. In New York City, that is simply not the case. The ‘yellow’ exterior of a taxi makes it easy to distinguish from other vehicles on the road. In addition, there are different rates for trips that leave the five boroughs; different rates for Newark airport fares; and a flat fare between Manhattan and JFK airport. This increased complexity – while necessary in the calculation of the fare – is potentially confusing if posted on a taxi door. Indeed, prior to this most recent change to the exterior markings, much of this fare information, in order to fit on the door, had to be presented in a size that rendered it less than useful. The fact is, we now have technology aides that we didn’t have back when the exterior fare markings were originally conceived. Each of the 13,237 taxis is equipped with a passenger-facing TV screen, and each trip begins with a display of the rate of fare on those screens. In addition, passengers have the option, at any point during their trip, to read a more detailed onscreen explanation of the various rates of fare, and to learn about the various components of each rate of fare. This does more to educate and protect consumers than any exterior decal, glimpsed briefly prior to entering a taxi, possibly could. And the taxi screens also provide pop-up passenger alerts whenever an out-oftown rate has been activated, or when a toll has been inappropriately charged. It is important to note that in recent instances of overcharging by drivers – in one case, activation of the out-of-town rate for in-town trips, and in the other case, improper collection of toll amounts – listing the fare on the vehicle’s exterior would not have prevented the overcharging. In both those instances, it was the GPS and the taxi screen which are part of the TPEP system, that allowed us to identify the instances of overcharging, to notify passengers of its occurrence, and to prevent it from happening again. As for the numerous visitors who fly into either JFK or LaGuardia airports, the Port Authority distributes fare cards to inform them what the cost of their trip could be. As you know, trips from JFK are a flat fare of $52 to Manhattan and the rate card lists estimated fares to other areas of the City. Tourists who travel from LaGuardia also have rate cards available to them that provide estimates of how much trips typically cost to various areas in the City. This is all information that is more helpful than what could be contained on the door of the cab. In simplifying the information on the exterior of the vehicle – the decal still informs prospective passengers that they are entitled to pay a metered fare, and that there is a flat fare between Manhattan and JFK – we are not alone. All of our “peer” cities – London, San Francisco, Chicago, Los Angeles, Philadelphia, Boston – require the fare to be posted on the interior of the taxi, not the exterior. However, based on the Council’s advocacy on this issue – in particular, in response to inquiries from Chairman Vacca and Council Member Garodnick – we are making one significant change that we believe will further assist passengers in making sure they are being charged the correct amount. With the next generation of TPEP systems beginning in February, we will require that the taxi screens give passengers the 5 option of viewing their own itemized fare information at any time during the trip – including the drop, the MTA tax, the time and distance portion of the fare, and any tolls or surcharges. Currently, this information is only visible at the end of the trip. With TPEP 2.0, this information will be available on demand. This concludes my testimony regarding the bills being considered today. I would like to thank you again for the opportunity to testify before the Council about these proposed items of legislation. And at this time, I would be happy to answer any questions that you may have. Chairperson 'NO SEE' is finally OUTTA HERE .... THANK GOD !! BACK on the taxi doors !! They were there for over SEVENTY YEARS, fer crissakes !! while I'm trying to driver my cab !!! GET THE RATES BACK ON.... NOW !! !